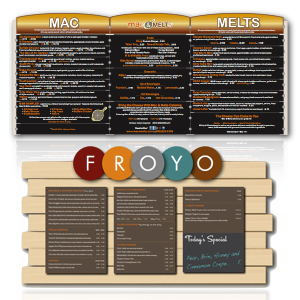 Our indoor menu boards come illuminated and non-illuminated with various styles and looks. Our magnetic menu boards are easy to change while our backlit menu boards are perfect for featuring promotions and sales. These products are perfect for automotive shops, cafeterias, convenience stores, education centers, food courts, grocery stores, restaurants, stadiums and theaters! No matter what business market you are in, we can help you with a custom solution that will grab your customers attention and help convert sales! Origin’s magnetic indoor menu boards make certain that you will never have to compromise the look you want for the flexibility you need. Our magnetic boards are available with full graphics featuring your menu items or in changeable menu strips and price chips. 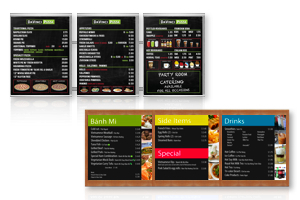 Need help printing graphics for your menu? Origin can provide you with assistance in that area too! Nothing will grab your customer’s attention more than an eye-popping backlit indoor menu board system by Origin. With three energy-efficient options to choose from – each with many configurations – you’ll be certain to find something that will light up your world! Origin recognizes that not everyone will be able to find something that will work for them within the standard product line. By tapping in to our wide range of capabilities we are able to develop custom solutions on a case-by-case basis. 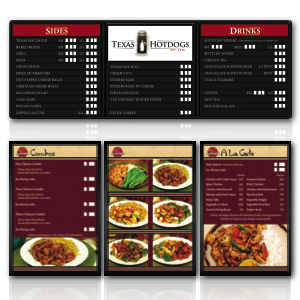 We work hard to meet all of your indoor menu board needs while also staying within your budget!